The ocean reefs of the Silurian had great biological diversity, like the coral reefs of today. Just as today the various species had different roles in a reef ecosystem. Some species built up the reef, others used it as protection and as a nursery. The only difference from today is in the species that occupy the various roles. Jawless fish with bony armour were the most common fish in the oceans. Today, the oceans are completely dominated by fish with bony skeletons. The Baltic island of Gotland was built up during the Silurian by various sponge and coral species that are now extinct. Today, other coral species and lime-secreting algae dominate reefs. 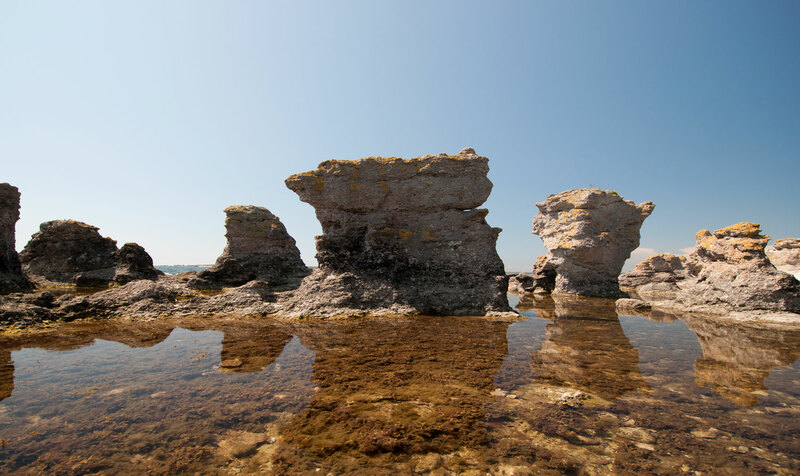 The rauks at Gotland consists of sponge and coral species that are now extinct. Living amidst the tropical reefs of today are large numbers of mussels, snails and starfish. The prevalent species during the Silurian were lampshells, sea lilies and squid-like cephalopods with shells. The Silurian oceans were completely dominated by jawless fish. They were covered with a thick layer of bony armour, much like the metal armour of medieval knights. Open water was not a suitable environment for Silurian fish. Because they were poor swimmers, they preferred shallow waters and coral reefs. Cephalopods and other invertebrates predominated in the open ocean. Jawless fish dominated the Silurian oceans. Living in the shadow of the jawless fish were various groups of cartilaginous and bony fish. They were related to today’s sharks and perch, and all were relatively small. Today, almost all of the nearly 30,000 known fish species have skeletons of bone. The other modern groups are jawless fish and cartilaginous fish (sharks and rays), which together total only around 700 species. Unlike Silurian fish, which lived in shallow waters, modern fish live in all kinds of ocean environment, from shallow bottoms and coral reefs to open seas. Some species, including mudskippers and lungfish, can even survive out of water for some time.